After some kilometres on the quiet road through the Tuscany-style landscape with vineyards as far as the eye can see, CAN PUIGNOLL emerges on a small hill top down a side road. From the moment you enter the property, you feel the tranquillity and the sounds of nature, which will make your vacation relaxing and stress reducing. In the garden, the sunshine makes its way through the treetops of the shady trees in the garden. Below the house, the pool area with the very large swimming pool (6 x 12 meters), has a perfect view over the hills and the vineyards, the first starting rigt at the end of the pool area. The house has been completely renovated and modernized to the smallest detail, respecting the original structure of the typical Catalan farmhouse. It has now a capacity of up to 11+2 persons. Lay out of Can Puignoll: The house is perfectly structured, with the lower floor being a very spacious common room with an excellent modern kitchen, a dining area with dining table and a sofa area with TV, DVD and fireplace. On this floor there is one bedroom with single beds and one bathroom. There is also direct access to the terrace with barbecue in the garden, which is very convenient, when you want to dine outside in the warm Catalan summers. Upstairs, you find the four remaining bedrooms, all of a very high standard and with bathrooms ensuite. Three of the bedrooms are double rooms with double beds and the fourth room is a triple room. The children with love the place with its many activities, for instance table tennis and table football and the swimming pool of course. As the total property covers 6000m2, there is plenty of space to play, and if they feel like it, they can visit the animals on the owners’ farm 1 km. away. The surronding area and activities: You can almost feel the sea breeze coming in from the Mediterranean Sea, which is only a short 25 km. drive away and as the crow flies, even shorter. Hence it is easy to drive down to feel the sand between the toes or perhaps pay a visit to El Vendrell, where the famous catalan musician and pacifist Pau Casals is honoured by a spectacular museum in his house. - Horse-back riding: Trails for beginners to advanced levels from 1 to 8 hours. - Wine tourism activities - Visits to the organic vineyards and see the process of wine-making - and taste! - Adventure Activities: Paintball, Buggy rides etc. Lisbeth and I (Bertel) are the owners of the company SYDENS FERIEHUSE. For the last 14 years we have engaged in letting out fantastic Catalan holiday homes, all of which live up to our criterias: they are authentic, charming homes and are all of a very high standard. We now let out more than 400 beautiful holiday homes, and some of them are advertised on HomeAway - We help Salvador and his family let out CAN PUIGNOLL. Catalonia : Discover the Catalan soul in a historical, carefully preserved but modernized country house. In comfortable distance from the crowded beach resorts, but still with the metropolis Barcelona, lively historical towns as Girona, Tarragona and Vic and the natural parks in The Pyrenees within short reach. We offer vacation in your particular pace, where you blend in with the open-minded and friendly Catalans. Enjoy the silence in the small hills in the pre-Pyrenees. Enjoy sports and outdoor activities as walking, canoeing or mountain biking. Or scamper about in the lively street- and café life in the Catalan towns. Here you will discover gastronomic, cultural and artistic impressions that stick. As something new we can also offer apartments i Barcelona and many more are coming. Or how about watching a football match along with 98.917 other spectators on FC Barcelona's legendary Camp Nou? The best advice is to come to Catalonia and see for yourself. Can Puignoll has the advantage of a very private situation in beautiful settings, surrounded by vinyards. And still the beach is less than 30 minutes away, and Barcelona 1 hour. The house is also very child-friendly with fenced swimming pool and a very nice playground. There are five bathrooms in the house. The five bathrooms are all spacius and there is one for each bedroom. 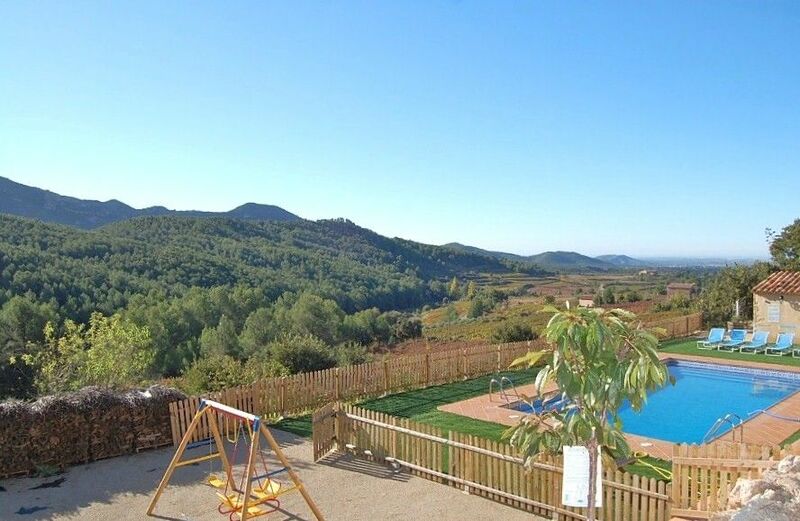 Inland in the northern parts of Catalonia you find this hidden paradise, which is a holiday home of very high standard and surrounded by wineyards as far as the eye reaches. You can even buy the owner's own wine in the house. Still after a few kilometers with curves, you will have easy access to the main roads, and the beach is actually only 30 minutes away. If you want to go to Barcelona or Tarragona, the drive is about 1 hour. Hence, the house is the perfect point of departure for exploring Catalonia, the house, however, will every day tempt you just to stay and enjoy life!